지자총통(池字銃筒)은 천(天)·지(地)·현(玄)·황(黃) 총통 중에서 천자총통 다음으로 큰 우리나라 고유의 대포이다. 길이 89.5㎝, 안지름 10.5㎝, 바깥지름 15㎝이며 명종 12년(1557)에 청동으로 만든 것으로 보물 제863호보다 1개월 앞서 만들었다. 총구쪽에서 화약을 넣는 약통쪽으로 갈수록 두툼하게 만들었으며, 손잡이는 2개였는데 모두 파손되었다. 마디는 총구에 있는 것까지 포함하여 모두 10개이며, 앞에서부터 일곱번째 것과 여덟번째 마디가 서로 붙어 있어 약통과 격목통을 구분하고 있다. 격목통은 원기둥 모양의 나무를 박아 약통 속에 있는 화약의 폭발력을 최대한 강하게 만드는 역할을 한다. 지자총통은 이미 조선 태종 때에 만들어졌고 세종 때에 이르러 더욱 발전하였다. 16세기나 17세기 이후에는 우리나라의 전통적인 총통 구조를 계승하여 총구, 격목통, 약통으로 나누었으며, 큰 화살이나 탄환을 넣어 사용하였다. With total length of 89.5 cm, inner diameter of 10.5 cm, and outer diameter of 15 cm, this is the biggest among the Korean traditional guns next to cheonja chongtong. It was made of bronze cast in 1557 (12th year of King Myeongjong’s reign), a month earlier than the making of another Jija Chongtong Gun (Treasure No. 863). As for the shape, the farther it goes from the muzzle to the gunpowder chamber, the larger its diameter. Originally, it had two handles, but both were destroyed. It has a total of ten knuckles including the one at the muzzle; the seventh and eighth ones from the muzzle are stuck together, indicating the borderline between the gunpowder chamber and the percussion cylinder. The percussion cylinder plays the role of maximizing the explosive power of gunpowder by putting a cylinder-type wooden bar into the gun. Jija Chongtong Gun was already made during the reign of King Taejong (r. 1400-1418) of the Joseon Dynasty, but its power was far more advanced during the reign of King Sejong (r. 1418-1450). 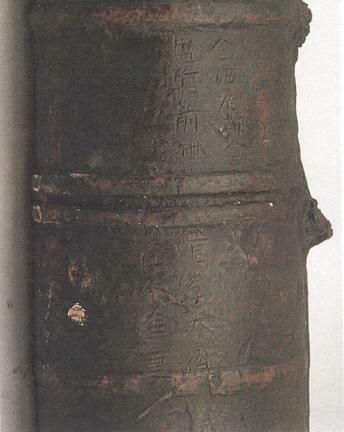 After the 16th and 17th centuries, the Korean traditional structure of gun was succeeded, divided into the muzzle, percussion cylinder, and gunpowder chamber. Big arrows or balls were fired by this gun.